In the depths of winter, I finally learned that there was, within me, an invincible summer. 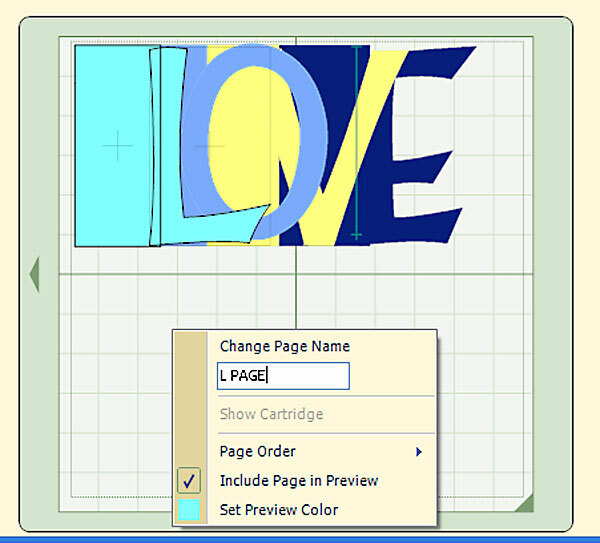 Joy asked what settings I use to cut chipboard on my Cricut Expression. I usually have my blade on 6, full pressure and speed - for everything!! Paper, cardstock, chipboard, cereal boxes! :) If I am cutting something very detailed, I will slow down the speed and pressure by one notch. You will need to use the multi-cut feature for chipboard and cereal boxes. I can usually get away with 2-cuts on cereal boxes, three if the blade is getting dull. Chipboard, I usually go with four, unless it is fairly thin. For my haunted house album, I used super-thick chipboard that has a white "coating" on one side. I cut it four times, and that still wasn't enough to go all the way through. (I am usually a regular blade - don't have the deep blade housing yet.) I cut it the rest of the way with scissors or used my craft knife - not a big deal since this was mostly straight edges. I have gotten a couple of questions on how I size the pages for the word books... I size everything "by hand" - I use the bounding box to stretch and re-size to however I want it to look. Then I turn on the shadow feature and click the letter for that page. I stretch it out to be the right height, and adjust the width according to how many letters (pages) will be in the book. Then I copy the square/or rectangle, create a new page in the cut file, and paste the square/rectangle there to start the next page in the book. Here’s how to create custom shadowing letters that fit perfectly every time! When creating the word book or word that you want to shadow, be sure you have the SHADOW feature clicked on. De-select the Shadow feature button, and on the keypad, click the letter that you want. Here, I have clicked the letter C.
Once you have the new letter adjusted, click Copy, to copy that image. Create a new page within your file and click Paste. Return to the original page and click Delete to remove the new letter. Repeat these steps on each letter that you want to appear shadowed, until you have all of the letters on the last page. You can then rearrange the layout of those letters to save paper! Open the cut file in Design Studio. If the letters are on the lower half, move them to the top. Don’t worry about “arranging” them, just move them above the 6” point on the mat. Click View, then Mat Size, then 12x6. This will change the mat size from 12x12 to 12x6. And that's it - email me (or comment) if you need help! As I posted a few days ago, I am a big fan of Cindy at www.stampinscrapin.com. She has tons of scrapping supplies - including Cricut and Bind It All supplies. Her prices are awesome, she has lots of sales, and her shipping is reasonable. I posted her website in an earlier post and had it spelled wrong - I have corrected the post and provided the correct address above. She recently emailed that she obtained rights to www.stampingscrapping.com, so you can use that URL as well. What weight is your chip board? I bought some on Ebay, that I believe is .22 weight. I recently bought some 12x12 chipboard from www.stampinscrapin.com. Same weight, and cuts like butter on the Cricut. (I use multi-cut, and cut three times.) I highly recommend StampinScrapin for Cricut, Bind It All, and other scrapping supplies - no affiliation, just a very satisfied customer - Cindy's customer service is amazing!! Here's my little secret though - cereal boxes! On the books that people ask me to cut for them, I use chipboard, but on personal projects, I use a lot of cereal boxes. You can cut on the Cricut using multicut 2x. Once you adhere paper to the front and back, and paint the edges - no one would ever guess it was a cereal box! Do you just glue paper on the chip board? I cut the paper on the Cricut as well, so that it is a "match" to the chipboard, then run it through a Xyron machine and stick it. If I don't get the edges just right, I cut it with a craft knife or sand it off with sandpaper. Let me start by saying - I am not an expert! But my word books are coming out pretty well, so I thought I would share how I make them! Feel free to comment if you have any questions or tips! Open DSS and determine which cartridges you will want for your book. You will need at least one cartridge with a solid rectangle or square. For this book, I used George for both, just to keep it simple! Before you add any shapes or letters to the first page, click the Shadow feature button. 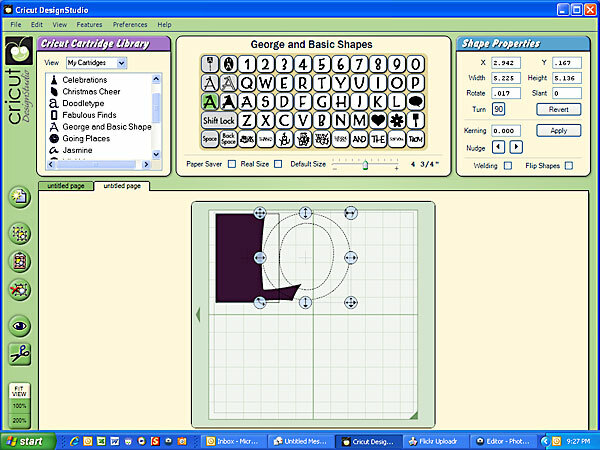 Once you have adjusted the shape, click elsewhere on the mat, so that the shape will no longer be selected. Click the first letter of the word you want to make. Once you get the hang of this, you may want to alternate between upper and lower case letters, but initially, I found it easier to go with all caps. 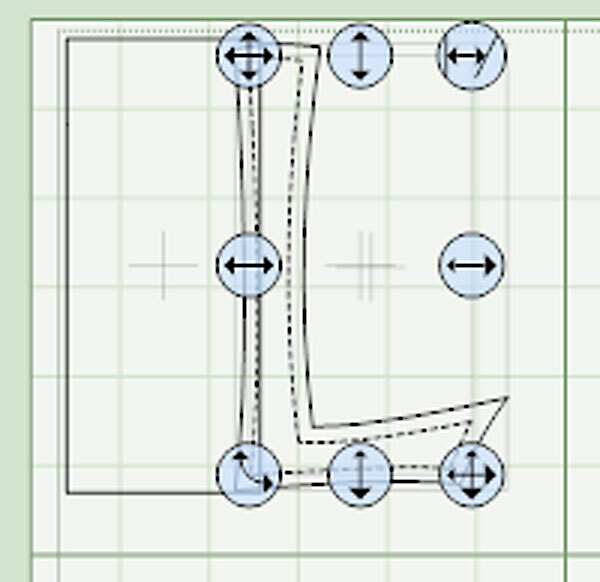 Use the bounding box “slider” to adjust the letter so that it overlaps the shape. (This is for welding, which we will do later.) Adjust the height and width of the letter to your taste. Click View, then New Page. Return to the first page, click on the rectangle to select it (you should see the bounding box), then click Copy. Go to the new page and click Paste. 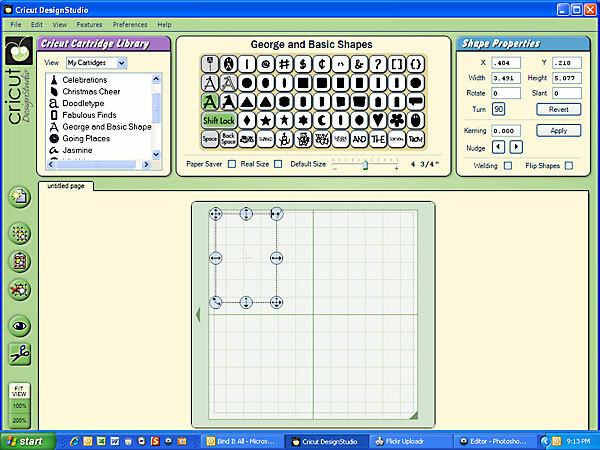 This will place the rectangle in exactly the same place as it is on the L page. Click the Preview button. You will see the images from the first page layered over the rectangle on page 2. Grab the bounding arrow (points to the right) and stretch the rectangle on page 2 so that it is wider than the original. Click off on the mat to deselect the rectangle, then click the letter O. When the O appears, move it to the right. In the image here, I don’t like how the O looks – too far away from the L, and a little too big, so now I use the arrows on the bounding box to adjust the rectangle and O to my taste. Then I click the preview button again to see how it looks. To create the rest of the pages for your book, simply repeat steps 1-6. Throughout this process, you can return to the previous pages and make adjustments. After each adjustment, click the Preview (eye) again to refresh the preview. If you no longer wish to see the preview, click View, then Clear Preview. You may find it easier to rename your pages as you go! All you have to do is right-click on the mat, type over the current name (white box), then click “Change Page Name” (or hit Enter). Click View, then Clear Preview. De-select the Shadow feature button. Return to the first page, and make sure that nothing is selected. Click the letter again for that page. Once you have the new letter adjusted, click Copy. Go to the last page (blank) and click Paste. Return to the first page and click Delete to remove the new letter. Repeat these steps on each page until you have all of the letters on the last page. You can then rearrange the layout of those letters to save paper! Once you have the pages laid out, you need to go back and weld the letters to the square/rectangles to make your pages. Return to the first page. Click the square/rectangle (bounding box should appear), then click the Welding box (a check should appear). Click the letter, then click the Welding box again. Click Preview, and you will see your bold, welded lines. Make sure everything looks the way you want it, then cut! Be sure to save all of your hard work!